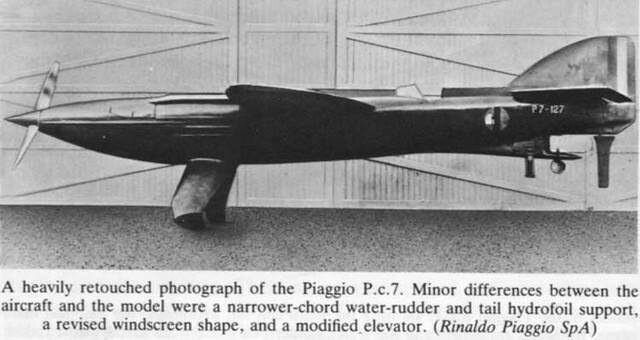 The oddest and most unconventional contender - probably for any aerial competition - was the Piaggio-Pegna PC.7. The floatplane (or should we call it a 'foilplane'?) was built for the 1929 Schneider Trophy contest. 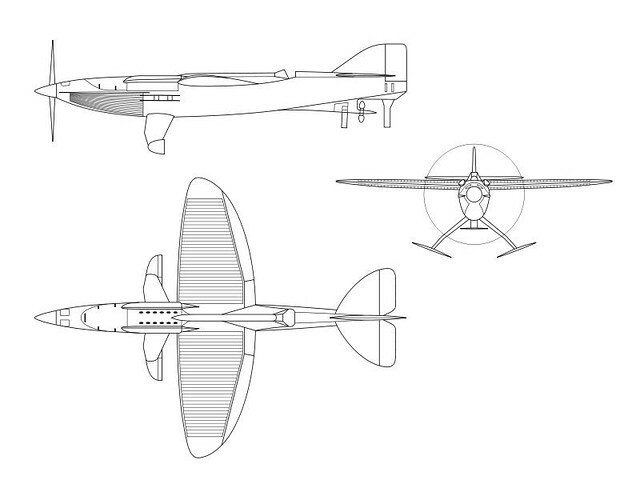 A cantilever high-wing monoplane with long slender fuselage, it had twin hydrofoils instead of floats and was intended to float with the wing resting on the surface of the water. 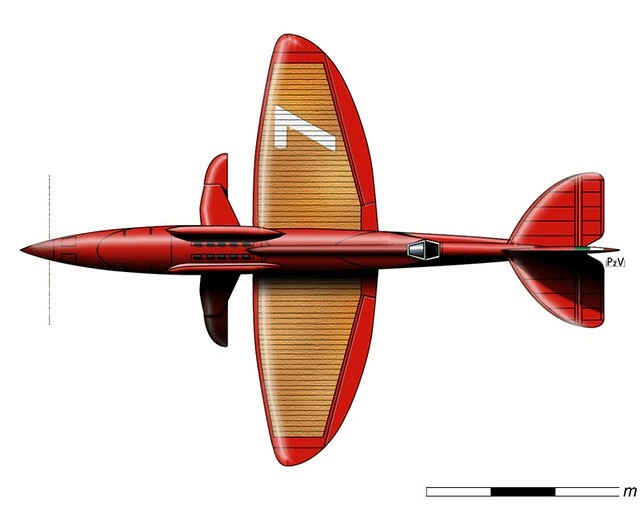 Without the aerodynamic drag induced by floats or the weight they added to an aircraft, Pegna projected that the P.7 would reach high speeds. Sources differ on the speeds he predicted, claiming both 580 km/h (360 mph) and 700 km/h (434.7 mph). The PC.7 never flew. Although theoretically possible, the control/clutch configuration would have required a pilot with more than two arms. In practice, problems with the respective clutches prevented the P.c.7 from ever taking off, and although water trials were conducted on Lake Garda by Dal Molin of the Italian Schneider team, the construction of a second aircraft was abandoned. "It's a bit sad to see their achievements underestimated while all kinds of super-duper Deutsche Technik are praised on a daily basis." Thank you so much for saying this. It is so true, especially in the fields of aircraft and ship design. 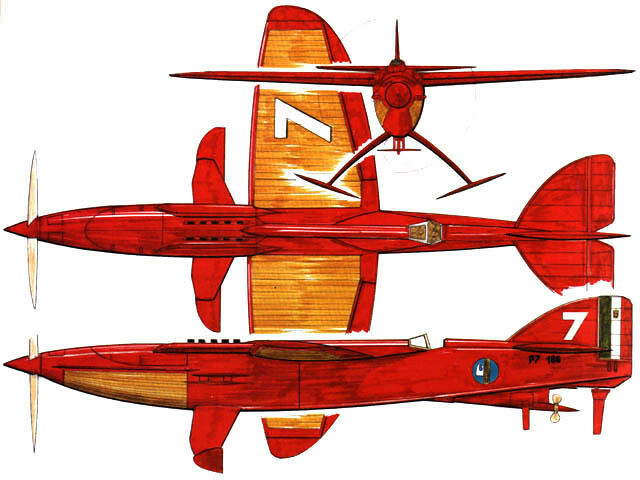 Some Italians were both ambitious and sane enough to build wonderful flying machines capable of setting world records in nearly every possible nomination - most notably speed (Macchi MC.72), altitude and distance. It's a bit sad to see their achievements underestimated while all kinds of super-duper Deutsche Technik are praised on a daily basis. Awesome futuristic looks, high hopes, deleriously grand promises, and ultimately untenable and insane...reminds me of the Fascist regime! But it looks Sooooo CoooooL !!!!!!!!!!!!!! !